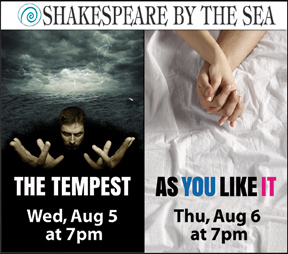 "As You Like It" Thurs August 6th. Showtime both nights is 7:00PM. An island fantasy -- passionate, visceral, fierce and magical. "We are such stuff as dreams are made on." Admission is free. Donations are encouraged. Bring a blanket or beach chair and enjoy the show. Street parking is available. Please read all posted signs. Lakeside Cafe ( http://www.lakesidecafe.com ) - adjacent to the park - is offering a Shakespeare Special for the shows: Use the password 'Shakespeare' when making reservations or ordering a boxed meal for pickup and get 10% off PLUS the Los Encinos Docent Association will receive 10% of the proceeds to help fund these Shakespeare performances. California Pizza Kitchen - Encino ( http://www.cpk.com/locations/encino-place/ ) - is offering a Shakespeare fundraising special: CPK Encino will honor 20% back to the Los Encinos Docent Association to help fund these Shakespeare performances when patrons order take out, curbside, or dine-in August 5th or August 6th and mention the word 'Shakespeare'. Maria's Italian Kitchen - Encino ( https://www.facebook.com/mariaskitchenla ) - has a Shakespeare trivia contest for FREE Pizza for the rest of 2015. Also keep an eye on their twitter feed ( https://twitter.com/mariaskitchenla ) for additional promotions and announcements. Thanks for supporting our supporters.